The Jonathan Blanchard Papers are a diverse gathering of items covering the family history of Wheaton College’s first president. Ranging from the scribbling of grandchildren to a petition for the abolition of slavery, they illuminate Blanchard in his many roles. The heart of the Collection is the more than 4600 letters preserved by his wife, Mary Bent Blanchard. Dating from 1808 to 1892, the items cover a wide range of topics with writers including family members, friends, students, Civil War soldiers, church associates, colleagues, reform workers, and others. These letters are a valuable resource for scholars, students, and other history enthusiasts alike. 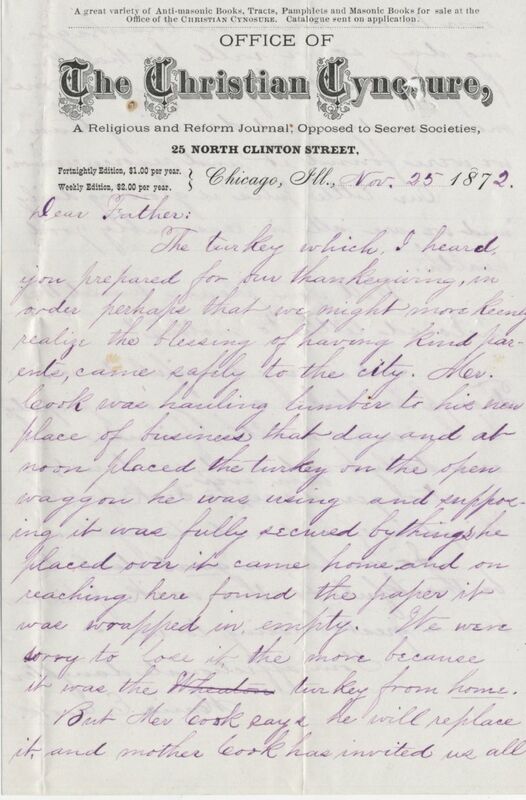 During this Thanksgiving holiday one such letter was written by Jonathan and Mary’s daughter, Maria Blanchard Cook from Chicago on November 25, 1872.